The very first race of the 2017–18 Tufts swimming and diving season will take place on Saturday, when the No. 11 Jumbos host the No. 21 Coast Guard Bears (3–0). After a period of rests and preseason practices, Tufts’ swimmers and divers are ready for a months-long campaign that climaxes with the NCAA Div. III National Championships on March 21–24, 2018. At last season’s NESCAC Championships, the Jumbos finished third overall. As a result, Tufts ensured a top-three conference finish for the second consecutive year. At the NCAA Div. III Championship, the Jumbos were ranked in 10th place out of 25 universities. This result, made possible by six All-American honors and six All-American honorable mentions, was a marked improvement over 12th place in 2015–16 and 23rd place in 2014–15. Junior Kingsley Bowen commented on what that placement meant to the team. Bowen has played a large role in the success of the team at both the NESCAC Championship and the NCAA Championship, both last year and during his first season on the team. Bowen was named Rookie of the Year in the NESCAC after swimming to first, second and third place in three different individual races, as well as a win and runner-up finish in two relay races at the NESCAC Championships in 2016. Earlier this year at the NCAA meet, Bowen earned three All-American awards of the Jumbos’ total of six. Of the six members of the 2016–17 team who graduated in the spring, arguably the largest loss was diver Matthew Rohrer (LA ’17). A four-time member of the All-NESCAC Team, Rohrer finished seventh in one-meter diving and eighth in three-meter diving at last year’s national championships. Yet despite athletes leaving the team, the Jumbos have also welcomed some new blood, with 17 first-years joining the squad. With their help, the team hopes to make even more progress this coming season. Seniors James McElduff, Tyler Shapiro and Scott Simpson will serve as tri-captains for this season. One of the captains’ roles is to build cohesion and sense of community within the team. The trio have been doing their job well already, according to senior Kai McGuire. McElduff was part of the cohort that travelled to the NCAA meet, where he earned his first career All-American honorable mention in the 400 meter IM. Coach Adam Hoyt will return for his 14th season in Medford after leading the team to improved performances in both championships. Diving coach Brad Snodgrass will return as well. Two new talented assistant coaches will join the staff starting this season. Joe Acquaviva is a 2014 graduate of Johns Hopkins University. 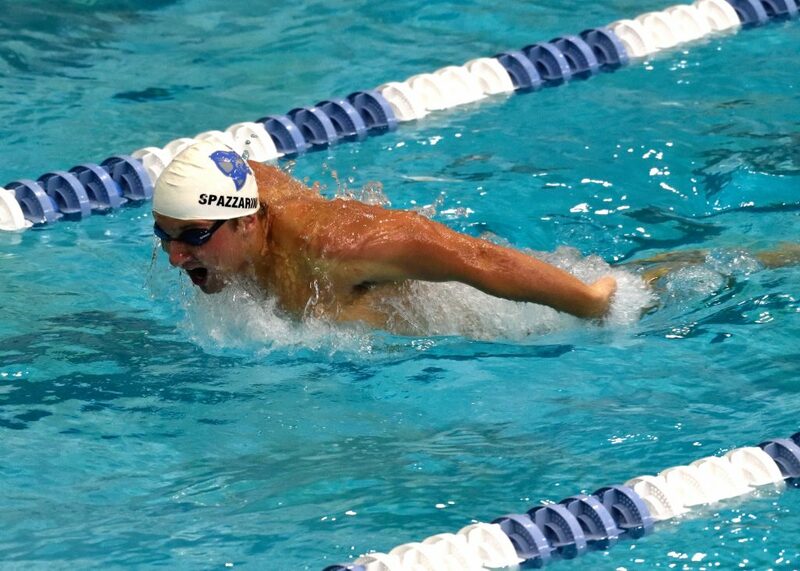 He swam for four seasons for the Blue Jays, serving as a team captain during his senior year. Acquaviva earned numerous accolades during his time in Baltimore, including 10 All-American honors and a NCAA Div. III national championship. He also had a successful coaching experience at the high school level before coming to Tufts. The other new assistant coach is Michael Winget (LA ’14). The Shelburne, Vt. native was the Most Valuable Swimmer all four years he swam for the Jumbos, breaking school records in over half a dozen events. Now he is returning to help his fellow Jumbos after coaching at Green Mountain Aquatics in Burlington, Vt. Along with maintaining a high level of athletic performance, the team really cherishes the fact that everyone the enthusiasm of its members for the sport and for the team. “I think a key in order to maintain our good performance at NESCAC is to keep having fun swimming,” Bowen said. The Jumbos’ opening meet against the Bears will be at the Hamilton Pool on Saturday at 1 p.m.
Sam Weitzman contributed reporting to this article.